My family was relatively modest or almost poor. I grew up in Horton, Michigan. My father was a pig farmer, and my mother raised me, my older brother, and younger sister. She also did bookwork for the farm. A family farm. I worked a lot with the pigs, but I learned a number of skills. My father started with a couple hundred acres, and now we’ve got a few thousand. The biggest thing I learned was a work ethic, being responsible. You’ve got animals that need taking care of, and you’ve got to follow through on what needs to be done. I saw how hard work paid off. When I was 7, my brother bought a canoe. We had a little pond on the farm. In Michigan, there are a lot of lakes and rivers, so canoeing is fairly popular and common. When my father was in high school, he had a canoe, and he talked about it. When I was 8, our town sponsored a canoe race. My father and his high school buddy used my brother’s canoe. At that point, the competitive canoeing bug bit my whole family. At age 10, I entered my first canoe race. That same year, I entered my first kayak race. We got involved with kayaking after we met Marcia Jones Smoke at a canoe event. She had won a bronze medal in the 1964 Olympics, and she invited my brother and me to train with her. I was born with two club feet and until age 10, it didn’t really affect me that much. I remember going to a special shoe store to get orthopedic shoes. I didn’t realize there was anything particularly wrong with my feet. I ran, I played. But between 10 and 13, I had three surgeries on my feet — one year apart. It was difficult taking a few weeks off school, having my feet cut up, then being on crutches for several months afterward while my friends were out running around. The surgeries did not turn out well, and I ended up worse off than before. I lost almost all motion in my left ankle, and the growth centers in my bones died. My left leg is about an inch and a half shorter than my right. But I think it made me realize that things don’t always go the way you want. Sometimes difficult things happen, and you just have to get through it and carry on. I started thinking about the Olympics when I was 12. I remember thinking it was the coolest thing that my coach, Marcia, had won an Olympic medal. That’s what I wanted to do. My first Olympics was in 1980 — well, it was supposed to be, but the U.S. boycotted the Olympics, protesting the Soviet Union’s invasion of Afghanistan. I was really disappointed, but I was 20 years old, and I had time on my side. I competed in my first Olympics in 1984. It was pretty incredible walking into the stadium during the opening ceremony and hearing the crowd go wild. I won a bronze. My second Olympics was in 1988. I had won the World Championship the year before, so I knew I had a chance for a gold medal. I won two. With the first medal, the finish was very close. The unofficial results listed me in second place and Australian Grant Davies in first. The time difference was three-tenths of a second, and I knew he hadn’t beat me by that much. I knew it was wrong. Each medalist had to sign a paper for their medal, so I signed for the silver. I asked, “Are you sure this is right?” We were in position to march out for the award ceremony when word came there had been a mistake: U.S. had won the gold. Obviously, I was in line right next to Davies. I was so excited, but I could see how disappointed he was. He was a real good sport about it; I was impressed. He told me he was happy to be an Olympic champion — even if only for 10 minutes! After the 1992 Olympics, I was 32 years old. A lot of my friends had established careers and families, and I was far behind them. So the ’92 Olympics were my last. My priorities had changed. Today, I’ve got a wife and two daughters. I’ve also got a business — Epic Kayaks — I’m running. But up to that last Olympics, training was my number one priority. I did manage to get an engineering degree, but always — always — what I was thinking about and daydreaming about was competing. Canoe or kayak? Kayak, although I enjoy them both. Kayaks are a little bit faster, and I like to go fast! The main differences between the two are: A canoe uses a single-bladed paddle, while a kayak uses a double-bladed one; canoes are typically open, and kayaks are typically covered; canoes tend to be bigger and sit high on the water whereas kayaks tend to be narrower and sit low to the water; and with canoes, you paddle on one side but with kayaks, you alternate strokes — right side, left side. I owe my success in kayaking to focus, dedication, and endurance. There are three components to kayaking: strength, endurance, and technique. It takes all three. Winning the race is the goal. But most important is the path you take to get there. As a child in school I always did well in math and science, so engineering became the field for me to go into. A combination of that and my experiences working on the farm — learning that sometimes you just have to make do and make something work. Also, from a competitive standpoint, after I started kayaking at a young age, I was always thinking about my equipment and how I could tweak it here or there. I started making some of my own equipment, so the engineering part of me got involved there, as well. The most important thing in life is to enjoy what you’re doing. When I’m in a kayak all of my problems seem to go away. That’s one of the reasons that now, even though I’m not competing, I look at kayaking as my little psychological break. I think I’d go insane if I couldn’t get out on the water. Just thinking about the kayak moving efficiently through the water, getting a good workout in, being outside breathing fresh air, seeing what’s around me — that’s very therapeutic for me. When your job is a career athlete, you put your sports performance ahead of everything else — much to the detriment, often, of everything else in your life. As a Cub Scout and Boy Scout we’d go out camping. At the same time, my family was doing camping trips, as well. Every summer, as our summer vacation, we would go some place on a week-long canoe trip. We’d take a couple of canoes and paddle during the day. At night, we’d stop and fish, set up a tent, camp, and cook. So I had both experiences. My road to the Olympics started with meeting Olympics bronze medalist Marcia Jones Smoke when I was 12 years old. She lived about 90 miles away from us and had a group of kids she was coaching. She invited my brother and myself to train with her. During the summers, we’d either stay with her or, later on, with some friends we had made in the area. 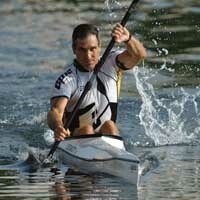 I’m fortunate that I found a sport like canoeing and kayaking because they don’t depend on lower body strength or feet. Most sports involve running in some form, and any sport that relied much on running, there’s no way I could have reached the success that I have in canoeing and kayaking. One thing I don’t do well is run, even though I try! I knew I had it made when I won my first 1,000-meter world championship in 1987. I always wanted to be the top in the world — and suddenly, I was. I have never done illegal drugs. I wouldn’t be where I am if it weren’t for my father and my family, who gave me the work ethic to push hard, train hard, and strive for success. I realize now that growing up on the farm, my father intentionally put me onto a lot of different projects — mechanical things, such as making things or fixing things — so I’d learn a number of different skills. During my first Olympic race I was both nervous and focused. Three-tenths of a second does not seem like much, but when you look across the finish line, if you’re experienced in racing, you can usually judge that much time. People don’t realize how much hard work and how many setbacks there are before you reach success. During a race, my mind is focused on the task at hand and the finish line. When I competed in the two Olympic events back to back on the same day in Seoul in 1988, I told myself to pretend that my day’s racing ended at the finish line of the first race and therefore, I wanted to get there as fast as I could. I didn’t want to be distracted by what might happen after the race. I knew if my focus was diluted by thinking about something else rather than just performing my very best in the moment and getting to the finish line as quickly as possible, that I probably would not win. Then, once I crossed the finish line, I told myself that I only had one race that day— the second race coming up. My motivation comes from wanting to be successful and do the very best I can. If I could do one thing over I would delay the surgeries I had on my feet until medical technology had become more advanced. To me, the Olympic Games are about sportsmanship, where people put aside their differences for a period of time and have a friendly competition regardless of what else is happening in the world. I pay a personal price when I spend so much time either training for competition or working on my business that I have less time with my family. Fame is short-lived — especially in a sport like kayaking. Our sport, typically, you hear about once every four years. You don’t see the top kayakers in the world becoming household names like you do in many other more popular spectator sports. My first love was … I was quite shy as a teenager, so I had a lot of crushes before I had a real love. Training for the Olympics meant I had to focus hard for several years at a time. I was out there every day, twice a day, giving everything I had. I think that made the difference between myself and some of the other competitors. About 70 percent of my training was actually in the kayak, doing various sprints of different types and lengths similar to what a swimmer or track runner would do. About 20 percent of my training was in the gym lifting weights and building strength. The other 10 percent was just general aerobics conditioning: running, bicycling, swimming. The most important lesson I’ve learned is to believe in what you do. My final 2 cents is that I think I’ve given all my “cents,” and I can’t think of anymore!